The main objective of the Cerebra Perinatal Research Centre at the University of Leeds is to make a difference in the lives of expectant mothers and their children. In this article we take a look at why this research is important, the progress being made and the longer term impact of our research. pre-eclampsia (high blood pressure in pregnancy). Worldwide, and in the UK, these adverse outcomes affect one in five pregnancies. Alone, or in combination, they may have serious consequences for the mother and/or her baby. Importantly, they are the leading causes of neonatal brain injury and later childhood disability (both cognitive and motor, ranging from poor academic achievement through to the spectrum of cerebral palsy). For many of these babies there is a need for additional neonatal support and care, especially for those born preterm. Ideally, we would be able to predict which mothers are at risk and put in place preventative strategies. However, identifying at-risk mothers is difficult as the reasons for these adverse outcomes are complex and poorly understood. We are a research group focused on understanding the causes of these pregnancy complications. Since 2007 we have been engaged in identifying the pre-symptomatic detection of these conditions and promoting preventative strategies. Thus reducing the incidence and burden of childhood brain injury. Our research has informed clinical practice, inspired multi-professional teaching, and led to a reduction in one of the key adverse outcomes, preterm birth. Over the period of Cerebra’s funding of the Centre, this work has led to a fall in preterm birth rates, with almost 350 fewer babies each year being born too soon. The development of the SCOPE cohort supported by our first Cerebra programme grant confirmed the usefulness of a biomarker called placental growth factor. In combination with other clinical risk factors this enhanced prediction, improved outcomes, and reduced the need for unnecessary preventive treatment. The use of this biomarker has since been recommended for use in clinical practice (nice.org.uk/guidance/dg23). Our research has always concentrated on ensuring effective clinical practice. Without successful implementation of research findings there will be no reduction in the numbers of babies born at risk of brain injury and later disability. The research need is greater for those women whose risk status only becomes evident after an adverse outcome and for some conditions where no suitable preventive treatment currently exists. It is for these women and their babies that we need to develop new and innovative strategies that can lead to effective preventive interventions. The main objective of the Cerebra Perinatal Research Centre is to make a difference in the lives of expectant mothers and their children. Our research focuses on understanding pregnancy complications and developing diagnostic/preventive tools. One of our key objectives throughout the programme was the assembly of a comprehensive demographic, clinical and tissue biobank, the Thousand Women Study. This information will be used to characterise healthy pregnancy and help devise predictive and preventative strategies for adverse outcomes. With Cerebra’s funding we have recruited over three thousand women in mid-pregnancy that will enable us to carry out both discovery and validation studies into potential biomarkers and establish new predictive tests, but also evaluate the reliability of those proposed elsewhere. We are also using innovative imaging technology that allows large areas of the placenta to be surveyed and visualised in 3D. By using this digital platform we will be able to perform a comprehensive analysis of healthy and diseased placentas and compare for structural or morphological differences. We hope to further our understanding of placental function in pregnancy complications and identify markers of susceptibility to disease, that could be used a prognostic tools. 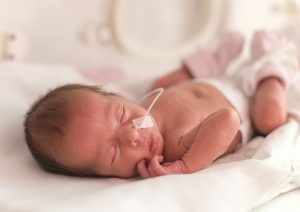 We are also currently leading a clinical trial, the Minidex study, which will provide much needed data on the safety and efficacy of very low doses of steroids in preterm/low birth weight infants who are at particular risk of developing lung and brain injury. Our research is important for families, and can make a huge difference to the lives of expectant mothers and in their children by reducing/eliminating the incidence and impact of brain injury. You can find out more about our research programme and watch a short video here.